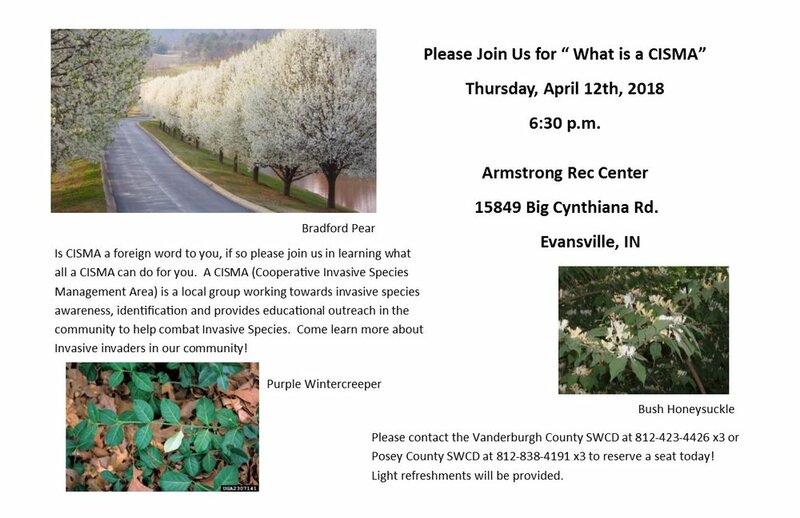 Did you know that Posey, Vanderburgh, Gibson, Pike, and Warrick counties all have plans to start CISMAs, Cooperative Invasive Species Management Areas? As part of this process, SICIM is partnering with local SWCDs to present "What is a CISMA?" Our first presentation is set for April 12th at 6:30 central at the Armstrong Recreational Center in Evansville (see flier for details). The second presentation is set for April 24th at 6:00pm eastern at the Pike County 4-H building in Hornaday Park, Petersburg, IN (see flier below). A call-out meeting will take place for Warrick County on May 14th at 1pm central in the County Commmissioners meeting room. For more information, contact Emily Finch at emily@sicim.info or Heather Zengler at heather.zengler@in.nacdnet.net. The Dubois County Soil & Water Conservation District (SWCD) is hiring an Invasive Species Specialist to work in Dubois, Daviess, and Martin counties. Applications will be accepted until April 6th. This full time position performs the technical work necessary for implementing invasive species and forestry programs and practices. It involves clerical, communication and public relations skills, and the ability to work with the general public. Salary ($30,000 annual, estimated) provided through a three-year Clean Water Indiana Grant, to terminate December 31, 2020. Click here for the entire position description. Volunteer workday at the Pioneer Mother's Memorial Forest in the Hoosier National Forest south of Paoli (1437 SE Main Street Paoli, IN 47454). Join us for an afternoon with friends, as we clear garlic mustard from the forest floor. Help remove this invasive species and restore native spring wildflowers! All ages welcome. Drop by anytime between 2-6pm. Interested in helping control invasive species in Orange County? Come out to learn about the new Cooperative Invasive Species Management Area we are forming for Orange County! Steering committee volunteers are needed. You can make a difference! Call 812-203-3033 for more info. Numerous invasive species of insects and diseases are attacking, and killing, our forests and landscapes. In order to keep an invasive pest from wiping out massive swaths of woodlands, as emerald ash borer is currently doing, government agencies and university specialists need to know what is out there, and where it’s being found. The best way to do this is to encourage landowners to act as our eyes and ears, and report to us when something new is found. Registration is REQUIRED but there is NO COST to attend. Questions? Contact Elizabeth Barnes at barne175@purdue.edu or 765-494-0822. Master Gardeners may count this program as 3 hours of Continuing Education…SWIMGA members please use code 902. Certified Arborists and pesticide applicators may receive continuing education hours. Following the Indiana Invasive Species Council's recent conference, SICIM wanted to share an update on Indiana's draft Terrestrial Plant Rule. Special thanks to Ellen Jacquart who compiled the list of suggestions to include when contacting the Governor Holcomb's office on this issue. • Invasive plants cost money. A 2012 survey of 120 agencies and landowners in Indiana found we spent $5.7 million to manage these species and protect our natural areas. Nationally, agricultural and control costs due to invasive plants are estimated at $15 billion per year. Each year the cost grows. And yet we continue to allow the sale of these damaging species. • Invasive plants hurt wildlife by crowding out the plants our native animals need for food and cover. • Most invasive shrubs and trees are little used by native insects. This reduces habitat for beneficial pollinators and predatory insects, as well as reducing the amount of food available for birds to feed their nestlings. • Invasive plants destroy habitat for rare wildflowers and animals, threatening two-thirds of all endangered species. • Invasive plants can become weedy in a home garden, crowding out other landscaping. • Invasive plants can also decrease your ability to enjoy hunting, fishing, mushroom collecting, bird-watching, and many other recreational pursuits by crowding forest floors and choking waterways. • Tell your story of the invasive plants you are fighting to control, and why it is important to you that invasive plants not be sold in Indiana. SICIM is proud to introduce our two new employees Emily Finch and Amber Slaughterbeck. Emily and Amber will be working on SICIM's new Indiana Invasives Initiative with funding from an agreement with NRCS. They are first of 4 regional specialists that will work around the state to promote the formation of local Cooperative Invasive Species Management Areas (CISMAs) and conduct invasive species education, outreach, and training. For more information on on the Initiative, or to contact the regional specialists, visit our Invasives Initiative page. Seventeen of us met at Noodles on Kirkwood today to have lunch and talk about invasive plants. We had a great discussion, led by Heather Reynolds about invasive plants being drivers (invading an area without help) or passengers (invading an area because of some underlying condition, like deer browse or other kind of disturbance). We talked about a simple experimental approach for those managing invasive plants on their land. For instance, after clearing an area of invasives, put up a small (2-5' diamter) exclosure of hardware cloth to keep deer out and watch to see if you have a difference between inside and outside the exclosure. For instance, if native plants come back vigorously inside the exclosure, but there are very few outside the exclosure - you may have a problem with overbrowse by deer or rabbits. We're going to think more about a simple protocol and promote something for all landowners to try this year. Linda Thompson noted that the Mayor will be presented with the Monarch Pledge to sign; Bloomington has so many good things going on with planting natives that it seems like a perfect fit. Nancy Anderson reported that Park Ridge East is hosting a free Milkweed for Monarchs winter sowing event scheduled for Sunday, March 4, 2-4 pm at St. Thomas Lutheran Church on East Third St. There is also a Native Plant and Native Seed Exchange event at the Park Ridge East Park for Saturday, May 12. For more details and updates, they have a Facebook page @PREnativeplantsgroup. Rex Watters noted that he is seeing more and more Chinese Maiden Grass (Miscanthus) moving out of cultivation and spreading into open areas, and that people need to quit planting it. Ellen gave an update on the invasive plant rule that will make it illegal to sell Miscanthus and 43 other species in Indiana - the rule is at the Office of Management and Budget, and appears to be stuck there. Take two minutes and help move this rule forward by emailing Governor Holcomb! Go to http://mc-iris.org/invasive-plant-rule.html for the easy steps on how to do this. Gillian noted that there are six neighborhoods in Bloomington actively organizing to control invasive plants and replace them with native plants. The movement keeps expanding! These neighborhoods and the good work they are doing will be on display at this year's Sustaining Nature and Your Land Day (June 16, 9 am to 1 pm, City Hall). Bamboo - we discussed the sites in Bloomington where bamboo is spreading aggressively. Ellen noted she'll add the problematic species of bamboo to the MC-IRIS comments on the city ordinances. We agreed we'd look for a quieter lunch place with a separate room for the next Invasive Lunch, which will be May 16. Location and topics for discussion will be sent out in advance. Our next MC-IRIS meeting is Tuesday, March 6 at 1 pm, Room 100A at Monroe County Parks and Recreation office. Eco Logic is hosting a conference on "Restoration for Wildlife" on Wednesday, March 7, 2018 from 8:00 AM to 3:30 PM (EST) at the Monroe Convention Center (302 South College Avenue, Bloomington, IN 47403). Tickets are $50. Animals Respond to Ecological Restoration Too! In 2018 SICIM is starting a brand new statewide project funded by the USDA Natural Resources Conservation Service (NRCS). This 5 year project will work to develop and support Cooperative Invasive Species Management Areas (CISMAs) across the state. For more information, check out our CISMA Project Page. For full details, visit https://extension.purdue.edu/vanderburgh/pages/article.aspx?intItemID=7603. The goal for this coming Indiana Invasive Species Council (IISC) biennial conference is to bring Cooperative Invasive Species Management Areas (CISMAs) and Cooperative Weed Management Areas (CWMAs) together with other agencies and organizations that manage invasive species and strengthen existing focused and collaborative efforts, as well as, empower statewide grassroots actions for effective invasive species management. 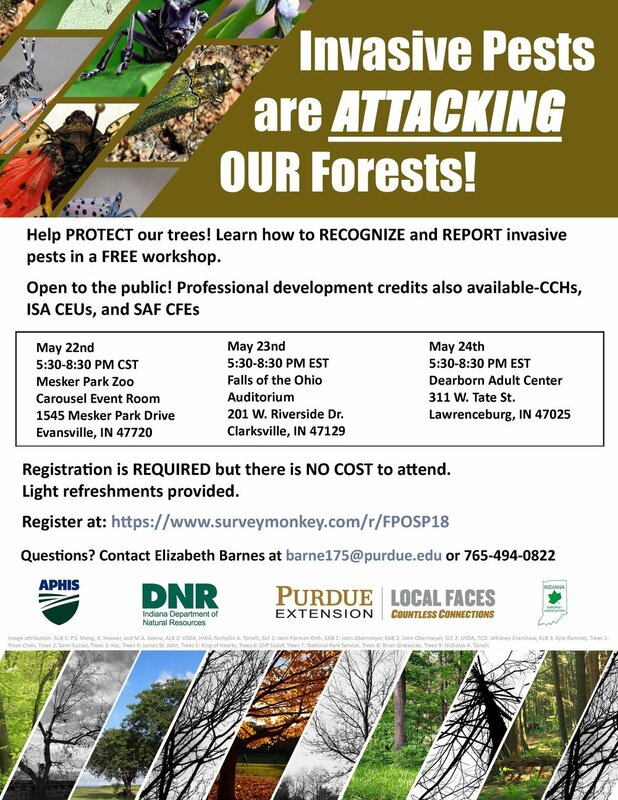 So, please join us and learn who’s doing what and why, new resources and tools and how we can, together, have a greater impact on invasive species management in Indiana and even in the Midwest. For full details, or to register, go to https://www.entm.purdue.edu/iisc/. Annual Meeting Presentations Now Available Online! If you missed SICIM's Annual Partners Meeting this summer, you can now view the presentations online! We hope that our new Presentations webpage will serve as a great place to share presentations and resources from invasive species events across the area. The Vanderburgh County SWCD along with Gibson, Pike, Posey and Warrick Counties have been awarded a 2018 CWI grant for an Invasive Technician which Vanderburgh is the lead district. They will be hiring this person early next year. A job application must be completed and turned into the Vanderburgh office, a resume may be included but the application must be submitted by December 15th, 2017. For more information, contact Erin Shoup at 812-423-4426 ext 3 or Erin.Shoup@in.nacdnet.net. The deadline to apply for the Regional Specialist positions has been extended until Friday, October 20th. On Wednesday, September 27 at 6 pm Mike Chaveas, Forest Supervisor for the Hoosier National Forest, will present at talk entitled “Your Hoosier National Forest and the Promise of Multiple Use Public Lands”. Chaveas will discuss the US Forest Service mission and history, provide background on how the Hoosier National Forest is managed, and share perspectives on advancing the dialogue around conservation. Green Drinks Bloomington is held the 4th Wednesday of the month through October from 5:30 – 7:30 pm at the Banquet Facility of the Upland Brewing Company. There’s a $5 suggested donation, some food will be provided. To receive a monthly reminder, write greendrinksbloomington@gmail.com. To learn more about Green Drinks visit www.greendrinks.org.